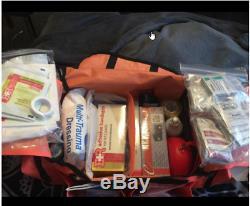 Trauma Bag First Aid Medical Emergency Supplies Kit Rescue Equipment EMT EMS New. 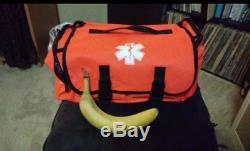 The First Aid Medical Emergency Trauma Bag has reflective stripes to ensure visibility and safety. 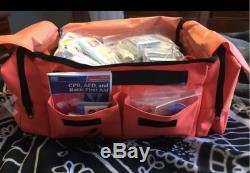 Emergency response First Aid Kit contains everything needed to respond to minor emergencies, packed in a portable, easy to carry a medical bag. The bag is constructed of nylon for rugged durability. Flap top with snap lock buckles permits rapid access. Twelve elastic interior holders and spacious compartments. Two zippered side pouches and dual front pleated pockets. Includes an adjustable, removable handle for easy carrying. The dimensions are approximately 7"H x 8" D x 16 W. If the end pocket is full the width can be about 18. 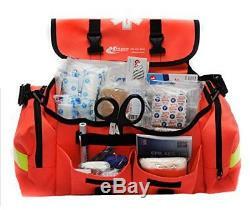 Items Included In This Kit. 1 Blood Pressure Cuff, 1 Stethoscope, 1 Scalpel, 5 Non-Adhering Pads 2x3, 5 Gauze Pads 3x3, 2 Cold Pads, 1 4oz Eye Wash, 1 4oz Saline Eye and Skin Solution Flush, 1 Penlight, 1 Emergency Blankets, 1 Utility Lister Scissors, 1 CPR Pocket Resuscitator. 1 Instant Glucose, 10 Splinter Outs, 5 Burn Gel, 1 Cohesive Self Sticking Roll Bandage 3 inch by 5 yards, 1 First Aid Adhesive Tape, 2 Gauze Roll 2 inch, 2 Gauze Roll 4 inch, 1 Triangular Bandage, 1 Multi Trauma Blood Stop Dressing. 1 First Aid Guide Book, 1 Surgical Dressings 5x9, 10 Ammonia Inhalants, 2 Pair Nitrile Exam Gloves, 25 Cloth Elastic. Strips, 13 X-large Patch Elastic Cloth Bandaids, 20 Knuckle Elastic Cloth Bandaids, 12 Fingertip Elastic Cloth Bandaids, 4 Oval Eye Pads, 12 Triple Antibiotic Ointment, 10 Antiseptic Wipes, 25 Alcohol Pads, 25 Hand Sanitizer, 10 Sting Kill Wipes, 10 PVP Iodine Swabs. Any product you return must be in the same condition you received it and in the original packaging. We usually respond within 24 hours on weekdays. Thank you for shopping at our store. 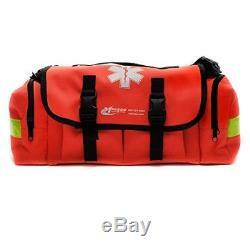 The item "Trauma Bag First Aid Medical Emergency Supplies Kit Rescue Equipment EMT EMS New" is in sale since Monday, March 26, 2018. 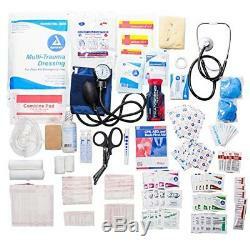 This item is in the category "Health & Beauty\Health Care\First Aid\Kits & Bags". The seller is "olvfef2012" and is located in CA.